Cook couscous in water as directed on package. Meanwhile, heat oil in medium skillet over medium heat until hot. Add shrimp; cook and stir 3 to 4 minutes or until shrimp turn pink. Add tomatoes, salsa and olives; mix well. Bring to a boil. Reduce heat to low; cover and simmer 3 to 5 minutes or until thoroughly heated and sauce is of desired consistency, stirring occasionally. Serve over couscous. Purchase fresh shrimp that look plump and new. Shrimp should smell fresh, with no hint of ammonia. For optimum flavor and texture, buy fresh shrimp the day you will use it. Otherwise wrap the shrimp tightly, refrigerate it and use within 2 days. Use a pretty yellow, blue or green serving platter for this colorful shrimp dish. 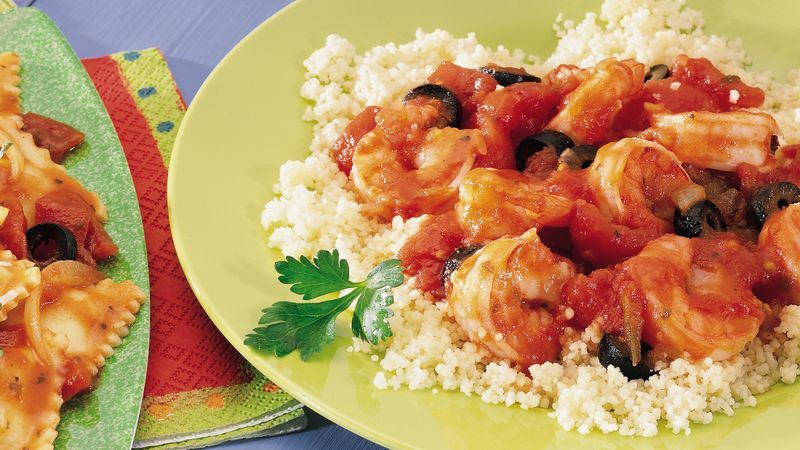 Mound the couscous on the platter, then arrange the shrimp and sauce on top. Tuck in sprigs of fresh cilantro or parsley as a garnish. Serve the shrimp and couscous with corn muffins and watermelon wedges.